Our Products >> Man's sterling silver ring inlaid with black onyx. Handmade sterling silver man's band inlaid with black onyx by jewelry artist Mark Hileman. 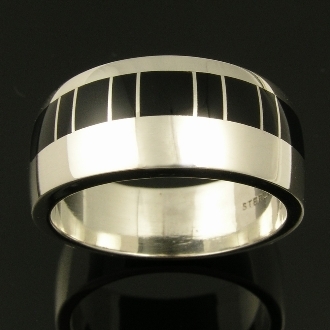 This contemporary silver inlay ring would make a great alternative man's wedding band. The band measures 10mm wide and is shown in a size 10 for scale. We can also make a matching his and hers inlaid black onyx wedding set if needed. Please allow 4 to 6 weeks for us to make the ring in your ring size.